GARDEN view of the Plymouth home. The house at 528 S. Plymouth Blvd. is one of the winners of the 2014 Historic Landmark Awards presented at the Windsor Square-Hancock Park Historical Society annual meeting on July 20 at the Wilshire Country Club. Busch sold the lot to Lee Mantle in 1926, and he had the home built. David F. Picker acted as both architect and contractor. Mantle sold the property to Ralph E. Filcher. The Filcher family lived in the home for 30 years. Kathryn Filcher added a sewing room and balcony. In 1962, the house was sold to Patricia Ann Barham, daughter of Dr. Frank Forest Barham, publisher of the Los Angeles Evening Herald. She added a swimming pool in 1963. Twelve years later, she sold the house to the Di Roma family. They added a guest house to the property in 1987. After they sold the house, it changed ownership several times until it was purchased by the current owner, an architect, in 2001. 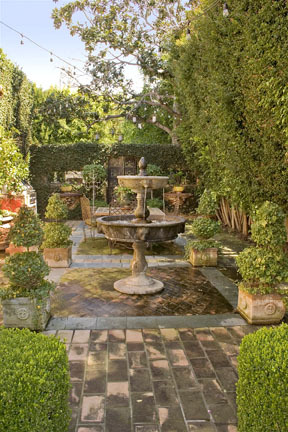 The owner has remodeled and restored the home and its gardens to give both a more Italian look. Many of the home’s original features such as the entry hall’s tiled floor and the staircase columns, made with a stone-like composite, have been preserved. Both inside and outside have been enhanced through the use of Italian hand-painted terra cotta tiles, and a Venetian cabinet and chandelier. The gardens, featured on the Historical Society 2013 garden tour, include Italian Cyprus, fig, olive and lemon trees and lavender bushes. Boxwood hedges and ficus trees are shaped to give the gardens an architectural look. Research was conducted by Suz Landay, Patty Lombard and Fluff McLean.